This is a gorgeous WOW card, absolutely stunning. 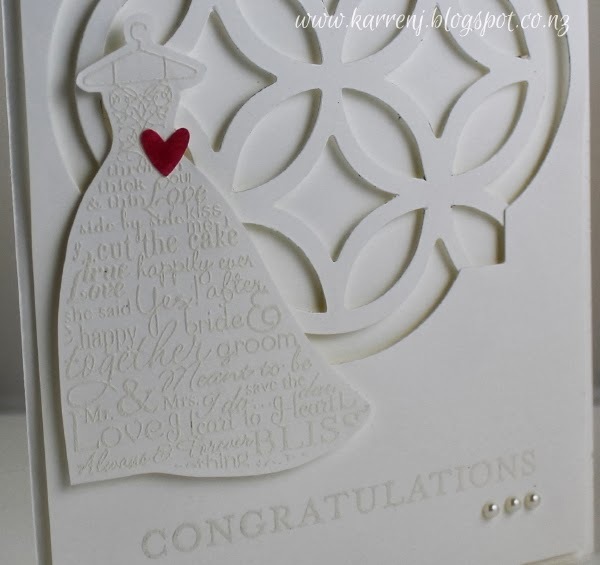 What a gorgeous card for a special lady! I hadn't seen the lattice in the window before. I LOVE it. You'll probably be seeing it on one of my cards down the line. Thanks for the inspiration, Karren! Wow! What an amazing lady! Your wedding card is stunning Karren. The addition of the wee red heart is so perfect. Merry Christmas and a happy New Year. This is lovely, Karren! That lattice is just perfect for a wedding card. Thanks for the shout out, too! This is simply stunning, Karren!!! WOW!! !